Every episode of South Park is hilarious! I noticed one too! When Blanket introduced his father he called him Michael Jefferson, but the police called him MARTIN Jefferson! "Okay,okay, I'll use my power to... Turn Kyle into a chicken!" "Goddammit Cartman" "Hahahahahaha! Now you are a chicken!" first of all, isn't this episode 807 ? then this is the only episode where kenny can be clearly understood, when he takes the place of blanket so he can go chop wood with stan and kyle.... but alas he still dies. 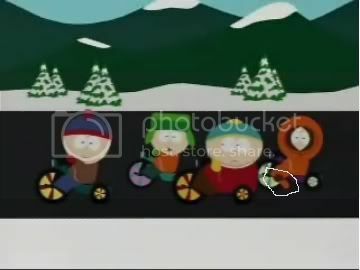 I DONT KNOW IF THIS IS A BLOOPER BUT I NOTICED WHENEVER THEY ALL SLEPT IN THE SAME BED, KENNY WAS THE ONLY 1 LEFT OUT. I DONT THINK ITS A BLOOPER BUT I JUST NOTICED THAT.